Hot on the heels of my recent “Alf’s Zoo” on Trust, here’s a fine example of the phenomenon. Yale College has blocked a website which two of its students had created. The students, brothers Peter and Harry Yu, had created an alternative version of the prestigious institution’s own course planning tool. “We found that it was really hard to find and compare courses when we first arrived at Yale”, one of the brothers told the media. Yale students are given tremendous flexibility to choose classes, and hence the brothers identified a key frustration with the official solution: a lack of adequate comparison data. Their tool added students’ course evaluation ratings to the class listings – a feature which proved immensely popular. The university’s response was heavy handed to say the least. After quibbling with the students about their product’s original name (a derivation of the official platform’s own title), they went a step further and blocked the site on campus. 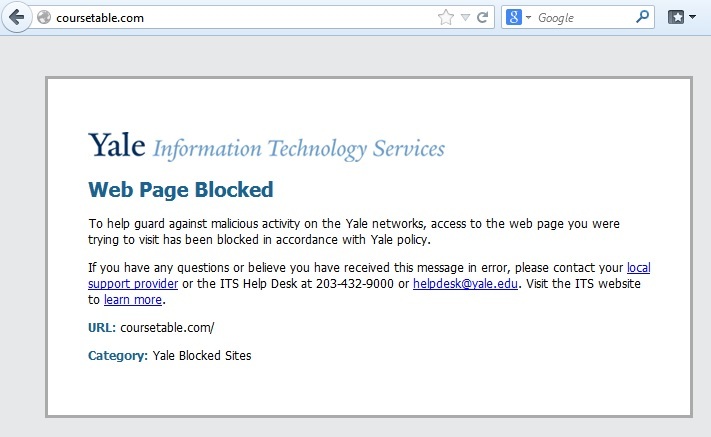 Students attempting to access the site were confronted instead with a Yale-branded screen, purportedly “to help guard against malicious activity on Yale networks”. But the brothers’ product, far from being a tool of malice, is a great example of a new generation of tools and technologies aimed at making consumers of services more informed… at least to its target audience. The university sees it differently, using one of its monopolistic powers (its complete control over its own network) to assert its sole control of the course selection process. Yale initially justified its actions on the basis that it had not permitted its course evaluation data to be used in this way. That would be a plausible (if mean-spirited) explanation, if the news had not subsequently emerged that another student-derived tool, a light-hearted random course selector, had also been blocked on the grounds of malice. Of course Yale are far from alone in behaving like this.